While analyzing your website to understand why visitors aren’t taking an action that you want them to, you make certain observations. The problems you identify may be technical issues (for example, the site loads too slow), inappropriate visual hierarchy on a page (for example, the sign-up button is placed right at the bottom of the page), distractions from CTA (like a fancy carousel that distracts users from the sign-up button, or you may even feel the information presented is not communicating the goal of the page. 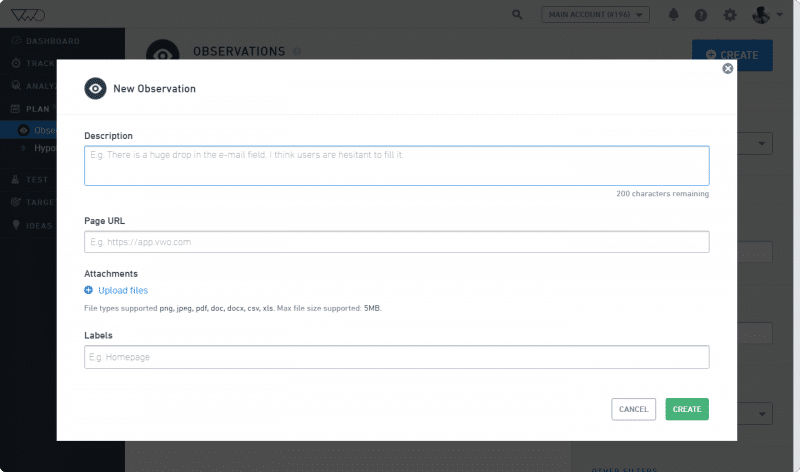 VWO allows you to record such observations. The recorded observations form the basis of identifying common patterns or problems that can eventually lead you to potential optimization opportunities. The observations can then be used to create hypotheses that can be tested to optimize your website’s conversions. To know how to create an observation, click here.